Ever wonder who the main companies are that make up and shape the media, telecoms and internet landscape in Canada? Who owns what? Where do Google, Facebook and Netflix – the new internet giants — fit alongside other companies that have long had a towering presence across key sectors of the media and telecoms industries in Canada: Bell, Rogers, Shaw, Telus and Quebecor? Using the Canadian Media Concentration Research Project data to shed light on the answers to these and other questions, we have created a new resource depicting the largest active players in Canada. 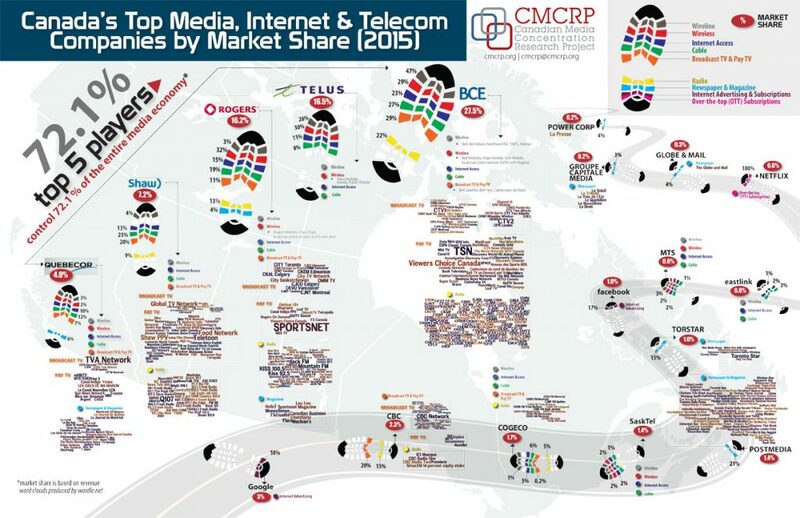 The result is our new “Canada’s Top Media, Internet and Telecoms Companies by Market Share” poster. The poster depicts the eighteen largest telecoms, media and internet companies in Canada on the basis of their revenues in 2015. Together they account for nearly 90% of all revenues across the telecoms, media and internet industries. However, just the “Big 5” — Bell, Rogers, Telus, Shaw and Quebecor, in that order — account for nearly three-quarters (72.1%) of all revenues. The poster also shows which telecoms, media and internet markets these companies have a presence in, the outlets they own, as well as their share of each of the markets they operate in and across the networked mediascape as a whole. the place of well-established traditional media enterprises such as the CBC, Torstar, the Globe and Mail is diminishing while a few new players have been added to the ranks, such as Eastlink and Postmedia. The poster was created to provide a sense of all the major players and the bits and pieces which make up the complex telecoms, internet and media industries in Canada. If you would like to purchase a copy of the poster, the cost is $40 for a 24″x36″ and $70 for 33″x55″, please complete the purchase form and submit payment. I would like to thank the two creative minds behind the posters, Sarah Green and Derek Ellis of SiLK Web Solutions. In addition, I also want to thank the two PH.D. students who have helped pull together the data upon which the poster is built, Lianrui Jia and Ben Klass.